Time for something for nothing. Those of you who have even the remotest interest in graphic design or manipulating digital photos will have heard of Photoshop. A product of Adobe, I think it's fair to say that Photoshop has been an industry leader, specifically on the Windows platform. It is possible to do the most menial of tasks as well as high end graphic design in Photoshop, and this is the reason for it's popularity, so much so that having something 'photoshopped' has become an accepted colloquialism for digitally manipulating an image. However the cost of this piece of software has become extremely restrictive and this has led to it being a pretty widely pirated package. There are competitors Photoshop, all of which cost a fair whack, except one that while it still has a way to go offer all that Adobe's resources have done to date, it is great for it's price. It has been christened Gimp, (GIMP is an acronym for GNU Image Manipulation Program.) The functionalities offered are more than sufficient for the type of projects I attempt, and for the amateur graphic designer it's a great way of legally achieving the same results you would do with the commercial offerings. It's an open source initiative which means that developers are able to offer add-ons to the core package, so logically over time it should be able to offer some seriously high end functionality. Oh, so did I mention the price? It's free!! Check it out @ www.gimp.org. They are gearing up for a new release soon which promises some great enhancements. On the 11th August an organised march against Crime in South Africa is taking place ... in London. It is being organised under the banner Act4SA. This has sparked a fair bit of debate online as to the merits of such an event. It's been fascinating reading the differing viewpoints. What I have found most encouraging is the amount of respect that each of the contributors have shown for those with differing perspectives. I am going to stop my commentary here however in order to not dilute the debate any further. What I am going to do is send you to those sites where the topic has and is being discussed. I have found these articles to be cogent and fair. Do yourself a favour and seek out the comments after each article. SA Rocks : Protest against crime to be held in London?? Bristol SoapBox : Here? There? Anywhere? Adrian Hope Baillie : Crime in SA - what now? I am not convinced that there is a necessity for a National Braai Day, or that we need to know in advance when it is to be prepared. Here in SA we are always ready to 'gooi vleis' on the grid. Nevertheless I found this video on Zoopy straight after ready this post @Bristol Soapbox and figured this must be a sign to share with my readers. Men, laugh out loud, ladies watch, enjoy, nod your head knowingly and then forget you watched it! The Tri-nations is over, the weather is either going to be wet, cold or too hot to go outside and The Simpsons Movie is only going to take a few hours of your time this weekend. So, use your free time and scour the web for that South African website(s) that excites you. Then post it at Online Trek or the Facebook group. I first wrote about this initiative on the 15th July and since then there have been some interesting votes cast. I will hold comment until after the results are published so as not influence the result in any way. But go and check out the two public nomination points mentioned above and see for yourself. The voting closes in just 4 days, and your vote will count. 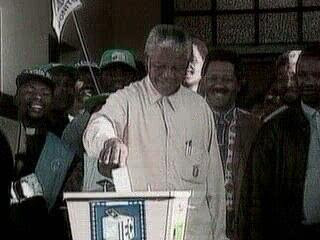 It's a general vote, no rules other than it's origin must be in South Africa. Don't miss this opportunity to share your gem with the rest of us. Changing the world, one gift at a time. That's the motto of a worldwide network, Freecycle.org. The idea is simple. You have something you no longer need or want? Simply post the details of the item(s) and someone who can use it comes to fetch it. Need something? Post your need and sit back and wait for someone to respond. No money changes hands, its a case of 'thanks for taking this thing off my hands.' It's a great way for non-profit organisations to get hold of things at no cost, enabling them to channel funds for other activities. I have been a member of the Cape Town group, which currently has 1268 members and have watched many worthy institutions and even individuals get hold of 'stuff' that have helped them immensely. The great thing is anyone, can obtain the goods offered. So if you are are student looking for a bookcase for digs or a community clinic needing gravel for your driveway you have a chance of getting your need met using this network. And let's face it we all have things stowed away that we feel are to valuable to throw in the bin, but not worthy of trying to flog in the classifieds. The one rule : Everything posted must be free, legal, and appropriate for all ages. Do Eish!! a favour, join your Freecycle community and communicate this post to those organisations you know that could benefit from this initiative. There, that can be your good deed for the year! MyBroadband.co.za have put together a nice little table with all the combined ADSL offerings available. This is a relatively new billing concept and has created a fair bit of confusion amongst those looking at installing ADSL and even more with those that already do have and ADSL line and account. This table makes the comparisons that much easier. Mooziko has added it's name into the video sharing game. It has some way to go before it becomes a major player, even when compared to Zoopy & MyVideo, however I like the idea of having something African-centric (as opposed to the latter two's South African dominated content.) While Mooziko still looks a little too much like a YouTube clone,something Zoopy has managed to avoid nicely, it definitely has a African feel to it. With broadband penetration in Africa still in it's infancy, it is understandable that there is not that many videos available to view yet. The creators really to need to catch on to the viral nature of this medium. The omission of an embedding option is glaring. Having said that, if they can keep plugging away, their is a lot of potential in this market, which has a different set of values and interests than the American audiences, a difference which Mooziko can exploit. Mutant Springboks - What does it mean? Why does it now need to take 30mins to read out 3o names? On Saturday Supersport viewers had to endure a painful half-an-hour of dancing, prancing, missed cues and the president of SA Rugby reading the name of the captain of the Springboks off a piece of crumpled paper. If you missed this riveting piece of television, click here, although I strongly advise against it. Why we need to see dancers running around a stage imitating springboks and mutants rappelling from the ceiling at a team announcement, beats me. Believe it or not that is not the topic of this post however. The new advert for the Springbok rugby team was flighted for the first time during this 30 minutes. I am always bemused at the need to advertise for support of a national team, nevertheless some of these advertisement have been pretty good, the SA Cricket World Cup Team promo been a case in point. But the thought of having to watch green mutant rugby players do their thing in between programs for the next couple of months does not fill me with excitement. I am sorry, I just don't get the relevance! There's no stirring of the national pride. No 'feel good' value. They had something with the Zulu drummer and warriors for a split second but lost me with the mutants on all fours. Maybe it was my frustration at the team announcement proceeding that has prejudiced my opinion, but I just don't get it! Here's the advert for those of you who have not seen it yet. Give it a watch and tell me what you think. It says a lot for an organisation, when they are willing to take criticism on the chin and respond. Amanda @ SAReunited did just that and placed the following comment in response to the post : Is there a future for SARenited? It's just a pity they didn't reply to my questions before the article was posted, perhaps it would have had a more positive spin. Eish!! is going to give them the doubt, watch the space for further updates. This is Amanda, co-founder of SAReunited . I love it that everyone is talking about us.. and I love what facebook has done... its a very exciting space to be in. Yes SAReunited is in need of a revamp but these are issues we are addressing before facebook even hit the streets in South Africa. Competition is good, but SAReunited will be in a slightly different space to facebook - but if we told you what that is we might have to kill you. The thing is that a new site take months to build, and of course you need to have a good business model. And I am pleased to say that SAReunited will in the coming months be totally relaunched - and contact will be free! Lucky us, we have had time to learn from facebook, linkedin, myspace, bebo etc etc. We understand what our market needs - we have half a million members - and now its time to give them the product they all want and need as South Africans. And to Eishman, you are right - the reason we are quiet is because SAReunited team are working harder than ever - and to remind you the very same team launched yesnomayB (which was voted top 20 UK web2.0 start up and the "apple of dating" and has a new membership base doubling every month!). Now its time for yesnomayB to move aside and SAReunited is getting the make over of its life.. watch this space..not long to go. Trust us, there will be alot to come back for. This is going to be the last Facebook post for some time ... I hope. Truly! I would just like to acknowledge Art from Online Trek. He has started a Facebook group for the readers & supporters of this blog. Is extremely gratifying to know that there are readers who take the time to read my ramblings on a very regular basis, comment and now even sign up to a group. If you are interested to see who else reads Eish!! click here. To those of you who have already done so, many thanks. I like to keep things short and fun on a Friday. I have come across fellow Capetonian, Jeremy Nell's work the past couple of weeks. He produces a couple of comics for various publications and, because he gets the power of the internet, publishes at his site www.trashmedia.co.za as well. Do yourself a favour and bookmark so you can make it a regular stop in your internet travels. I have always taught my daughter that while swearing is very rarely necessary and often shows a weakness in your ability to express yourself, as well as being very hurtful and offensive to those that hear them, there does exist times where a good vloek can be deemed appropriate. That said, I have decided that my blog is the not appropriate place to do so, which is a pity as the morons pictured below deserve a way more offensive title than the subject of this post. These pictures were taken outside one of the nations big multinational's offices. There was plenty of available parking not even 20m away, but these guys decided that they were way to important to park and walk the extra few meters. After all if the person is that disabled they will have a chair with wheels, right?!? BTW, all these pictures were taken at the same time ie. there were SIX cars taking up the disables bays at one time, in fact when I reported this to the reception there were SEVEN! Feel free to add your expletives in the comments!! Is there a future for Sareunited.com? I have mentioned in previous posts how I have been drawn into the Facebook subculture. It's been an ironic seduction, especially as it had it's genesis when I was messing around to research for the article : Facebook, am I missing something! One thing struck me as I browsed through my list of friends the other day. A few years ago I joined Sareunited. There slogan : "Connecting South Africans Everywhere." It was a great idea, allowing you to find and interact with your old schoolmates. It has been a great success story and, it must be said, almost an essential service considering how South Africans have spread their wings and found themselves living all over the world. Now as Facebook sweeps across South Africa as it has done else where across the world, I have found those same people that were listed in Sareunited on Facebook. The difference being, you now have an profile to look at and you are able to interact easily. The problem with starting a conversation with someone you haven't seen in 5, 10, 20 years via email, is how do you start? How much of yourself do you reveal when you write that first, 'this is me?' Now with Facebook that is all taken care of in the first 'Add XYZ as friend.' The act of requesting and confirming is like that first 'Hi,' handshake, or whatever greeting gesture takes you fancy. Now you are able to see what your friend has been up to and is currently doing. Without having to send mails back and forth, you are able to keep up to date with their movements, and it's unobtrusive. I went back for a browse @ Sareunited and, it must be said it suddenly feels rather archaic ... web 1.0-ish. It's rather sad, and I sincerely hope they find a way of reinventing the site. In my case there are still more contacts in my Sareunited account then in my Facebook profile, but then two things must be remembered. I haven't been active in Facebook for 2 months yet, and there is no telling how many of those contacts in Sareunited actually have details that are updated. It will be a shame if a great South African product becomes defunct. There is a massive database, active or not, of South Africans who invested their time inputting their details @ Sareunited and I can't help but think that this resource is not being utilised creatively creatively. To close I must state that I did send Sareunited a request for comment on how they intend meeting this competition, but to date have not had a response. Let's hope that's because they are burning the midnight oil as they work on exciting new features. Podcamp Cape Town ... Why is no-one talking about it? I am a little confused. I have just learnt that Cape Town is going to get it's own PodCamp. For me it's an exciting development. I have been a consumer of Podcasts since just a few months after Adam Curry's Daily Source Code became what is generally accepted as the first podcast to be offered for download. I have found this form of new media refreshing and a necessary antidote to some of the mainstream media available here in South Africa, particularly radio. In fact, I even ventured into the world of podcasting myself, with an experimental show in 2005/6, but decided to leave that sphere of the New Media revolution to those with voices worth listening to. Voices such as Rob Walch @ Podcast411 & Michael Butler @ The Rock & Roll Geek Show, both of whom have from time to time mentioned this thing called Podcamp. They have had me salivating as they described the meeting of like-minded people at an 'unconference' discussing all things 'New Media' in a relaxed manner, no airs and graces, no heirarchy, simply sharing ideas as to what can be achieved using this remarkable vehicle, the internet. Here's the reason for my confusion. Is it just me, or has their been very little coverage of this event? The first I heard of it was when my Facebook feed showed that Vinny & Jeremy were going to be attending this thing called PodcampCapeTown. I did a quick Amatomu, Muti & Google search and besides Glenn of The ZA Show (the engine behind this initiative), ClickKliek & Ernst Kuschke, I don't see any mention of PodcampCapeTown anywhere? Glen's announcement was on the 29th June, and age ago in web terms. So hopefully Eish!! blogging about it will help create a little more traction. It's difficult to tell exactly how many have committed to go as there are two places to register, the wiki www.podcampcapetown.com & FaceBook.com, but perhaps it's not so much the number of attendees that count rather what is discussed and how what is discussed filters through into the various New Media entities currently generating content and how it spawns new ventures. Perhaps it's not so much the number of attendees that count but the number of individuals who wish they could've attended. Perhaps it's not so much the number of attendees that count rather the quality of the presentations. And perhaps it's not so much the number of attendees that count rather the amount of fun that those attending will have. In fact let's be honest, it's not so much the number of attendees that counts, rather the amount of hype! The broadband explosion here in SA is very close. Telkom has put us in a unique position to be ready and waiting when it does. I can't help but think that this could be an answer to Fred @ Ideate's musing "Cape Town, wake up!" Although born and currently living and working in the UK, he has deep roots in Cape Town & South Africa, as he was raised here and begun his swimming journey here relatively late in life. His first swim been a Robben Island swim. I have swum with him and listened to him speak about his achievements, and he is remarkable in the way he sees himself as being unremarkable. Now he as achieved yet another first. Swimming 1km in the North Pole. It took him 13 minutes and 50 secs to swim the distance in water of -1.8°C. 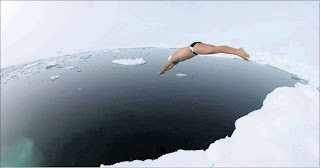 As he states it's sad that he is actually able to find water to do this swim as the water should actually be frozen, which is why he does these amazing, or stupid, swims to raise awareness of the effects of global warming. No rock concert necessary! As The Times states on their front page : EISH COLD! My good friend, Arthur from 'Online Trek' has begun an interesting project. He is trying to find the 50 best South African websites. This must not to be confused with a Top 50 list where the result would be purely related to the number of hits and/or page views [for this check out www.satopsites.com : although looking at the top sites listed here you can see why there is a need to Arthur's type of list]. The 50 best is collated by the number of votes received for the websites. What I like about the concept is it allows those smaller websites and their creators and designers to get some exposure. Just because a banking or news site gets a huge amount of visits doesn't mean the visitors are getting a pleasurable experience when doing so. They need to get a certain job done, or get the information they need, so will put up with an archaic looking site or a dog slow experience to do so. The project is still new so click here and leave a comment or go to the Facebook group that has been created and do the same, you could influence those voting after you with your choice. Gooi -ing movie after tv series after stage play after cd, Bill Flynn is as a part of South African culture as Mrs Balls chutney. It's weird to think he is no longer with us, but he has left as with all sorts of sounds and images to remember him by. "Bill, you made us laugh. You made us cry. and at times, made us have a good long look and laugh at us as afrikaaners. i would like to dedicate one song to you: Frank Sinatra…. i did it my way. And i’m sure you would have said “i did it sideways” via con dios"
... aka Oh Schucks... here comes UNTAG! Click here to download "The Toyi-Kaka". A gees rugby album recorded AFTER we became World Champions. A CD celebrating the Cricket World Cup in 1996. With Paul Slabolepszy. Click here to download the "World Cup Fever Song". A comedy opera album having a bit of fun with The Three Tenors. B.O.K.K.E A CD made for the 1999 Rugby World Cup. By public demand - second comedy opera album. Click here to download "Tenors Racket". Released after Celebrity Big Brother. Last month a Eish!! readers had a great discussion around the post 'I remember more ...' remembering the way things were. A fair portion on the contributions revolved around the media and tv in particular. Paul, a regular reader, sent me a link to a YouTube video that brought back a whole load of early tv memories. Remember La Linea? The contemptuous two dimensional character that SABC used as a filler? Somehow the creators managed to get so much personality into the simplest animation sequences and it always left you wanting more. Tens of thousands have now either discovered or rediscovered this series through Youtube. For more of the same click here (there's a whole load). It amazes me how many people are not aware of the following two sites, they are extremely useful, and provide a great service, bookmark them now! The first one, is www.payfine.co.za. As the name suggests it's a way of avoiding the queues at the Traffic Department, paying your fines and remaining within the law, even though you broke it to start with! It's quick and easy to register and allows you to search either by notice number, or by ID number. The latter being particularly useful when you are unsure whether a fine has been paid or after the 'dog ate the notice.' In the FAQ they give you a 6 step payment process, but realistically once you have registered it's a simply search, select, pay, 1-2-3 process. Now for the catch. Currently the following municipalities are on board with www.payfine.co.za. Cape Town, Johannesburg, Stellenbosch, Paarl, Swellendam and Mosselbay. If your municipality is not listed perhaps you should be putting pressure on them to do so. Incidentally, another way of paying fines without making the trek to the traffic department is via FNB atms. Personally, I prefer doing so from the comfort of my home. The second site, is unfortunately only available to Capetonians. www.energy.co.za is an easy to remember and even easier to use online prepaid electricity vendor. You simply register, input your meter number and you are ready to buy your electricity from the comfort of your home. No more trekking off to the local 7Eleven to buy electricity in the middle of the night, while the family showers in candlelight! I have been using this site for over 6 years now and it amazes me how few people are aware that this type of thing exists. For the rest of SA I have another site for you to try out: www.easypay.co.za. While it's operated by a reputable company, I have not given it a try as I have found www.energy.co.za has fulfilled my requirements and has never given me any hassles. Nevertheless, according to their site they have signed up municipalities in all the provinces, so if anyone decides to use them or is already using EasyPay to buy their electricity, let us know how well the process works. Eish!! has been quiet for the past 2 days. Yes, it's only been two days. I took the family for a quick trip up to Johannesburg. 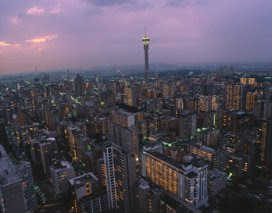 As a born and bred Capetonian, the thought of going to 'Joburg' for anything other than business is a rather odd one and while I have made a fair amount of business trips to the city, it has probably been close to 20 years since I have made this trip for anything other than business myself. So it was with a fair bit of trepidation that I agreed to book the plane tickets and organise accommodation. Now, if you can organise a little less traffic, some green grass (in the winter), the removal of some of the roadside billboards, a little more oxygen in the air, more chilled drivers, some sort of beacon that indicates North, a real mountain and a little bit of coastline (the valley of the waves does not count, in fact it's in another province) then you may just have the perfect city. The life of Eish!! has been a little crazy! I somehow think 5 days of stress to get ready for 2 days of leave is a pretty bad return on investment. Make yourself a cuppa and give yourself 4 and a half minutes, you will not regret it. What are your 7 wonders? New7Wonders Foundation is giving the citizens of the world to vote on the seven wonders of the new world. The project has garnered a fair bit of traction and it has been covered by most major news organisations for some time now. BUT TIME IS RUNNING OUT. If you want to have your say you have just 2 (TWO) days to vote. The result is going to be announced, with huge fanfare on the 07/07/07! Fifty percent of all net revenue raised by the New 7 Wonders Project is to be used to fund restoration efforts worldwide. One such project is the mission to re-create the giant Bamiyan Buddha statue in Afghanistan. Why not go and register your vote, it may be cool to tell your grandchildren one day that you played a small part in deciding the what they had to learn for their history exam! Feel free to share yours. Another Web 2.0 - images, audio, etc ... I think I like! I got an email this morning announcing the launch of a new web 2.0 image and audio hosting site called OneDump. But after giving OneDump the obligatory once over, I actually kind of like it and may very well begin to utilise it quite extensively. I like the idea of been able to organise your uploads into folders and use these new repositories to access files anywhere and use them for links for this blog, for example. It's interface is also nice and functional. Everything is easy to understand and, importantly, do. So if you are looking for somewhere else do these things, give them a try. The comment on the name still holds true though!